With these arctic outdoor temperatures, do you bundle your pup up for below freezing temperatures, sleet, and snow? If you do, then good move! You’re already taking steps to ensure your furry companion stays comfortable and healthy during the cold winter months. However, there are plenty other problems that cold weather brings. Here's a short list of ways you can do even more to make your furry friend comfortable during cold weather. Since this list is not all-inclusive, please feel free to add your tips in the comment section below! - Keep the air moist. Dry air can affect your dog’s skin just like it does yours. You know that dry, itchy feeling you get? Dogs can feel that way, too. Keeping your home humidified helps avoid itchy, flaky skin. - Remove excess snow. Towel dry your friend's fur after rolling around in the snow will protect your pet’s skin. Don't forget to pay attention to snow clumps stuck between toes! - Keep feet clean. Gently wash your puppy’s feet and belly regularly to remove harmful deicing chemicals and any last bits of snow and ice. - Bathe less often. While you’re cleaning your friend's feet more often, you might feel the urge to give your furry friend a full bath. Try to resist that urge, and bathing them less. Stripping the oils from your dog's coat will leave their skin less protected. If you must wash your dog, ask your vet or groomer for recommendations on moisturizing products. - Skip the haircut. Fur is nature’s way of protecting your furry friend from the elements. Allow it to do its job. If your pet has a long coat, go ahead and give it a little trim to prevent it from dragging on the ground, picking up excess snow, but wait with the haircut until the weather is warmer. - Winter wardrobe. 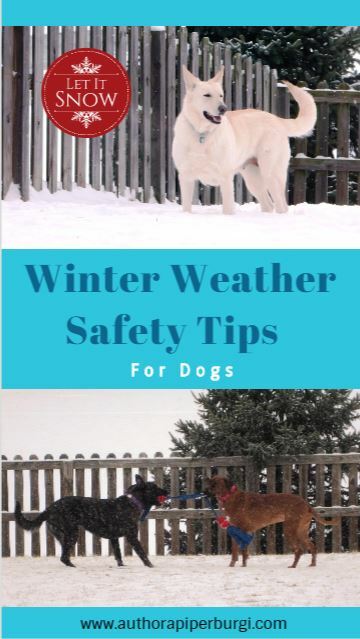 A lot of short-haired dogs were not made for cold, snowy weather and definitely benefit from a jacket or sweater that helps protect them from the cold. - Dog paw wax and boots Puppy pads can quickly dry out, become irritated and crack during the cold winter months. If your dog doesn't mind wearing boots, then go for it! If not, rubbing their pads with dog paw wax before going for walks can save them from irritation. - Offer more food and water. Dogs can benefit from a few extra calories and water during the cold weather season, as they burn energy to stay warm. - Keep them warm. Check your dog's bedding and favourite resting places to ensure they’re warm and away from drafts. An extra blanket or two will help keep them comfortable. But above all, when you do go outside with your furry friend, have a boatload of fun together!